Over the weekend I was doing a little Christmas Shopping (I swear I do it everyday) and this weekend Sephora happened to have their holiday 20% off in store event so I decided to take advantage of it. I did get another Naked Palette but this time its for my mom. My mom loves neutral colors so I thought this would be a great gift for her. We were shopping a few weeks ago and she seen this and said she loved it. I also picked myself up a few things considering I got a $20 off gift card in my email so it couldn't of came at a better time. I also picked up a Nars Blush in Sin, Makeup Forever Hd foundation, The Body Shop coco butter, Two Sephora nano lip liners, and of course waiting in line I had to check out the little things they had and purchased one of benefits little sets that has mini trial products of their BadGal Lash, Hoola Bronzer, and I'm not sure what the other thing is suppose to be. I'm still waiting on some things in the mail to do my Black Friday Haul so once I ever get that I can show you a few beauty/fashion related things I got for myself. Did you get anything from this sale or with you emailed gift card? I got e-mailed a $15 off card. I am going to use it on a Christmas present for my mom. 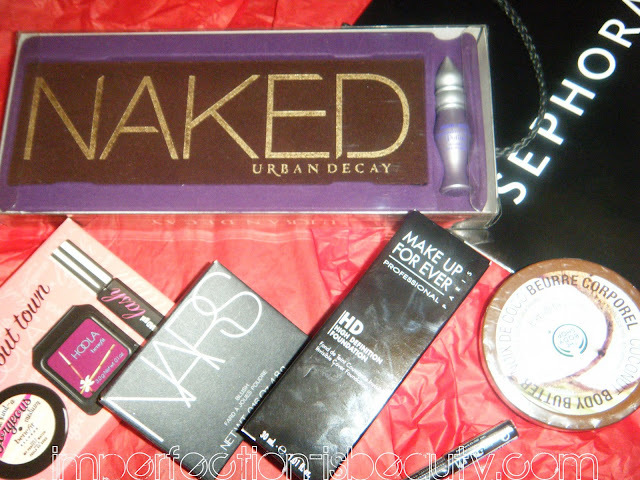 :) Did you buy the Naked Palette 2 off of Urban Decay's website? Just curious. @Dani Yes I did I just got it yesterday in the mail! i entered in your amazing giveaway!! thanks so much! Aweee mom as gonna be happy! ;) great haul hun. whattttttt? no way so lucky!! you picked up some great stuff ! I love your blog!! I've read so many of your posts, I'd love it if you had a look at mine! Oh lucky! I only got $15 off!